Saint Peter, Metropolitan of Moscow, was born in Volhynia of pious parents, Theodore and Eupraxia. Even before the birth of her son, the Lord revealed to Eupraxia the preordained blessedness of her son. 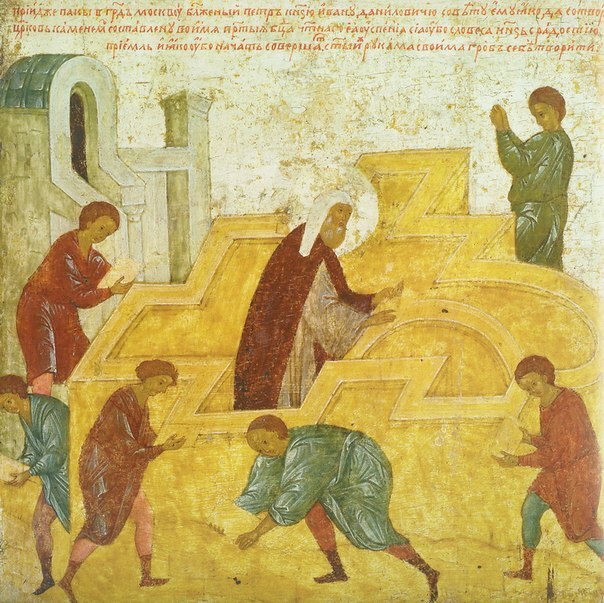 At the age of twelve, young Peter entered a monastery. He successfully studied the sciences of those times and eagerly fulfilled his monastic obediences. The future saint devoted much time to an attentive study of the Holy Scriptures, and he also learned iconography. The icons painted by Saint Peter were distributed to the brethren and to Christians who visited the monastery. Because of his virtuous and ascetic life, the abbot of the monastery had Saint Peter ordained as a hieromonk. After years of ascetic labors at the monastery, the hieromonk Peter, with the blessing of the abbot, left the monastery in search of a solitary place. He built a cell at the Rata River and began to pursue asceticism in silence. Afterwards, at the place of his ascetic exploits, a monastery was formed, called the Novodvorsk. A church dedicated to the Savior was built for the monks who came to him. Chosen as abbot, Saint Peter guided his spiritual children, and never became angry with a guilty monk. Instead, he instructed the brethren by word and by example. The virtuous abbot and ascetic became known far beyond the vicinity of the monastery. 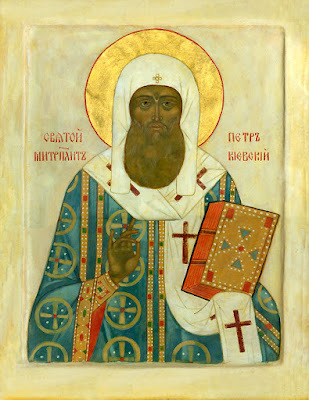 Prince Yuri of Galicia frequently visited the monastery in order to receive spiritual instruction from the holy ascetic. 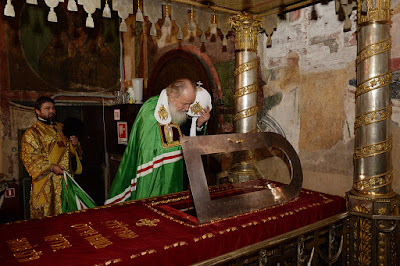 Once, in his travels through the Russian land, Metropolitan Maximus of Kiev and Vladimir (Dec. 6) visited the monastery with words of instruction and edification. 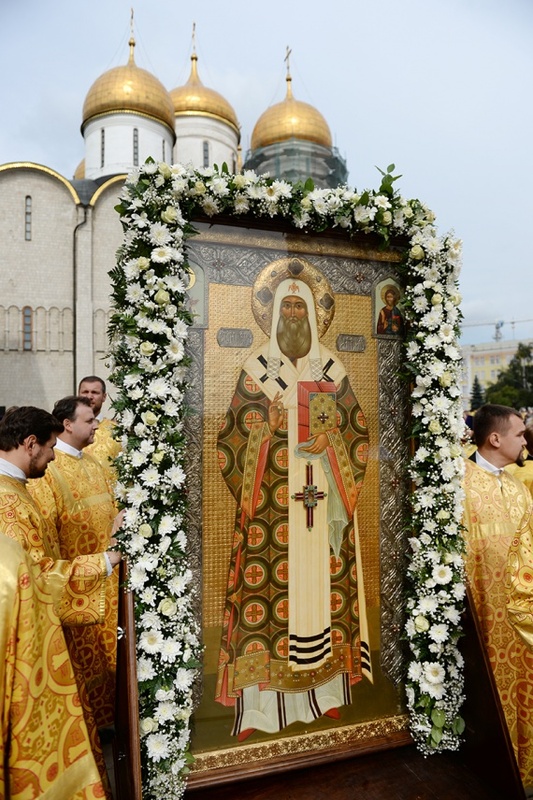 Having received the blessing of Saint Maximus, Saint Peter presented him with an icon of the Dormition of the Most Holy Theotokos, which he had painted. Saint Maximus prayed before the icon for the salvation of the Russian land entrusted to him by God until the end of his days. When Metropolitan Maximus died, the See of Vladimir remained for a certain time unoccupied. An abbot named Gerontius, aspiring to become the primate of Russia, went to Constantinople with Saint Peter’s vestments, archpastoral staff, and the icon he had painted. The Great Prince of Vladimir, Saint Michael of Tver (Nov. 22), sent him to the Patriarch of Constantinople with a petition that he be appointed as Metropolitan of Russia. The words of the Mother of God were fulfilled. Patriarch Athanasios of Constantinople (1289-1293) elevated Saint Peter as Metropolitan of Russia, bestowing upon him the hierarchal vestments, staff and icon, brought by Gerontius. Upon his return to Russia in 1308, Metropolitan Peter arrived at Kiev after a year, and then proceeded on to Vladimir. 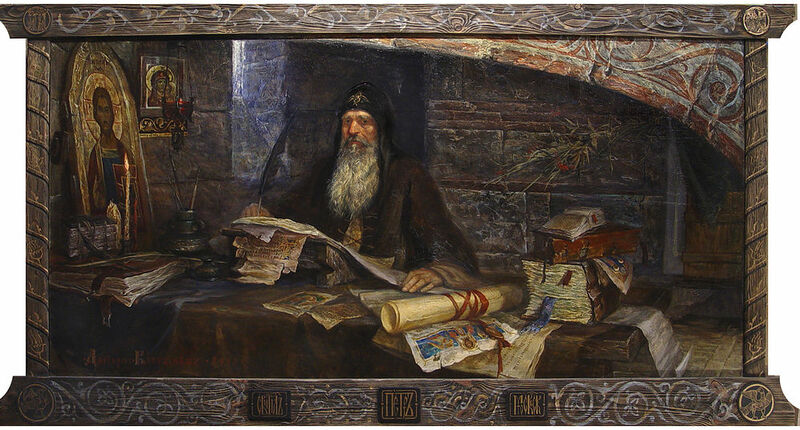 In the year 1312 the Saint made a journey to the Golden Horde, where he received a decree from Khan Uzbek, safeguarding the rights of the Russian clergy. With his blessing, the foundation of the Cathedral of the Dormition of the Most Holy Theotokos in the Moscow Kremlin was laid in August 1326 (according to Tradition, the foundations of stone churches are normally laid in the spring). This was a profoundly symbolic blessing by Saint Peter. 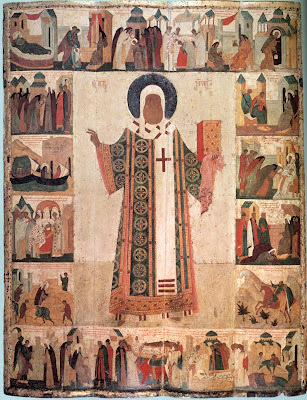 The veneration of the first hierarch of the Russian Church was affirmed and spread throughout the Russian land. In 1339, under Saint Theognostus (Mar. 14), Saint Peter was numbered among the saints. Princes kissed the cross on the Saint’s tomb as a sign of their fidelity to the Great Prince of Moscow. The Russian Chronicles mention him frequently, and no significant state undertaking was initiated without prayers at the grave of Saint Peter. The relics of Saint Peter were transferred in 1472 and 1479. In memory of these events, feast days were established for October 5 and August 24. The formerly fruitless land rejoices: Christ has revealed a light who shines in the world, and heals our infirmities. Therefore boldly rejoice: He is a Hierarch of the Most High Who was his fellow-worker in these things. We lovingly hasten to thee with praise, O champion and wonderworker of the land of Russia. As thou hast boldness towards the Lord, save us from affliction, that we may cry to thee: Rejoice, support of our city.